(Verses 15-17) This portion of the Ephesian letter constitutes an exhortation to the readers to live like wise men. “See then that ye walk circumspectly, not as fools, but as wise” (15). It used to be commonplace to speak about “the Christian walk.” It is the theme of this extensive section in Ephesians (4.1ff.). Paul uses the verb walk several times (4:1, 17; 5:2, 8, 15). The idea is not new to Paul, however, Jesus had already spoken of two gates, broad and narrow, from which we have to choose, opening into two paths, likewise broad and narrow, leading either to destruction or to life (Matthew 7:13-14). But even before our Lord, the great and decisive spiritual choices of God’s covenant with His people had been regularly described as a choice between two paths and two ways of walking. In fact the Old Testament uses “walk” more frequently in the sense of a lifestyle that it does of physical movement. The language is appropriate. We can often tell a great deal about someone from how and where they walk. The way a person walks is one of the easiest ways to recognize them from a distance—“I would recognize his walk a mile away” we sometimes say. It should be likewise with Christian believers. How we conduct ourselves should make us easily recognized as those who belong to Christ. We walk in love; we walk in the light. Now, Paul adds two further details: (i) we are to take care how we walk, and (ii) we are to walk wisely. “Circumspectly” suggests looking all around, giving attention to all circumstances, details, and consequences as one might do when passing through a very dangerous place. It expresses the idea of living in strict conformity to a standard, guarding against anything which would be improper or unbecoming for the Christian. The thought is further explained by the words “not as fools, but as wise.” It may be translated, “Watch (or, Look) carefully, then, how you walk.” Believers are to walk as people having the character of wise men, not fools. Believers are wise because we have the Spirit and the wisdom of God . . . “Christ is made unto us wisdom” (1 Corinthians 1:29-30). His words imply that in living the Christian life we need to think about what we are doing, and to look to make sure we are on the right path?the path that begins at “the narrow gate,” and though it is “difficult” to follow, “it is the way which leads to life, and there are few who find it.” There is another path, but it must be avoided at all cost?many go this way because “the gate is wide and path is broad,” but “destruction” awaits all who take this path; all who wander off the narrow path (Matthew 7:14-15). This requires wisdom—wisdom to see the dangers (temptation to sin, the weakness of the flesh, opposition from Satan); and wisdom to know how to respond in a godly and biblically instructed way—holy wisdom which comes from heart-concord with the will of God, and with a watchful use of thought and of every faculty for its intended purpose. 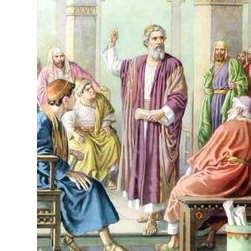 Had not Christ Himself told His disciples to “be wise as serpents”? (Matthew 10:16). As you walk, make all you can of the events of life, and use them for Him.